Jane Austen lived in Bath from 1800 to 1805, and later chose the city as the setting of 2 of her novels - Northanger Abbey and Persuasion. Jane Austen lived in Bath from 1800 to 1805, and later chose the city as the setting of 2 of her novels - Northanger Abbey and Persuasion. 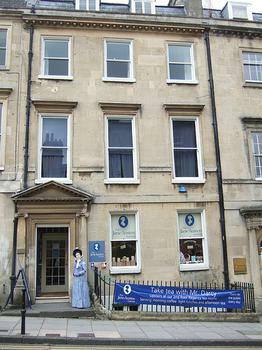 The Jane Austen Centre, located in one of the Georgian houses where she stayed, displays a permanent exhibition on her Bath experience, and the influence that her time here had on her writing. Get a glimpse of early 19th century Bath through displays, tea rooms, and costumed characters. You can relive the days of yore in some of the vintage costumes, and see the waxwork portrait of Austen.